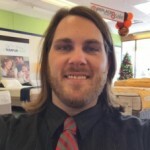 Why should I even obtain a mattress protector? Having a cover is always a good idea. 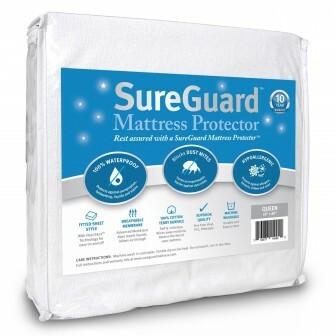 Getting the best mattress protector is an even better one. You don’t want you mattress stained. And I’m not even talking about the damage to the aesthetic appeal of the mattress. I’m talking about warranty. A mattress warranty may be very long. 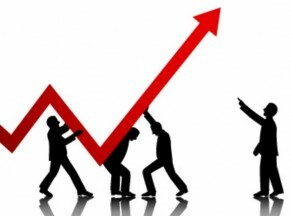 Manufacturers are willing to give you not just years, but decades. Sounds good, does it not? Alas, while a warranty is a good thing (and a long-term warranty is even better), it’s only good until it’s void. And stains do that. It seems easy enough to get rid of a stain. After all, once you do that, the warranty is still good, right? Maybe. But here’s something you should consider as well: stains on mattresses are virtually impossible to get rid of. And here’s the thing. Most of those liquids have a smell. And the inherent urine smell is not something you’d want. Sweat is also not good. It has no smell per se, but what it does have is a lot of nutrients for bacteria that do produce that awful smell. The other biological and nutrient fluids are also susceptible to many bacteria that are quite capable of producing unpleasant odors. And let us not forget about the fact bacteria may be harmful to your health. How does a protector help? 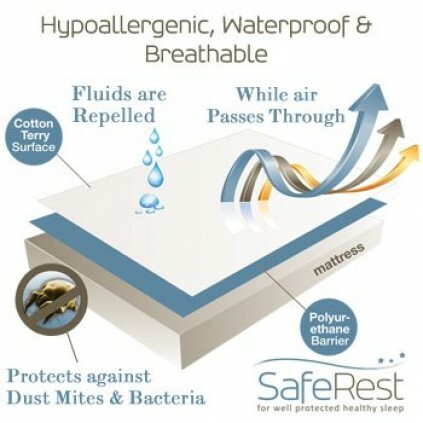 A mattress protector prevents whatever substance that is capable of causing stains from actually reaching the mattress. What do you do when the cover is stained instead? Simply remove it. That’s it. The mattress should be okay. Do I need a waterproof cover? Most people think they do. Most manufacturers want people to think they do and that their covers are waterproof, even though it’s not the case. You only need a 100% waterproof protector if there’s a risk of bed-wetting or considerably large amounts of liquid spilled over the mattress. I already have a mattress cover, thank you very much! If that’s what you’re really thinking, I can only tell you one thing: no need to be so antagonistic. Jokes aside, you should have more than one mattress protector. Get at least two of those. It doesn’t matter what is the second protector like, as long as it does its job. It might outright terrible. What would you need it, then? Why, so that your mattress wouldn’t be unprotected when you’re washing your primary protector. 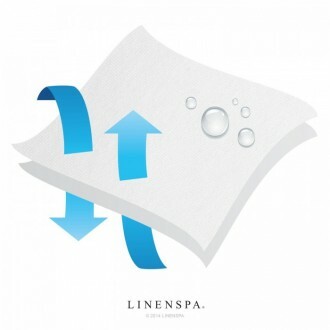 How do I wash my mattress protector? Some of them are machine washable. If you don’t know if they are, either check it with the manufacturer or assume they are not. Either way, it’s usually highly not recommended to iron the, to use bleach, dry-cleaning is also a bad move. The top ten list of today is opened with this mattress cover. The protector comes in 10 varieties: Full XL, Twin XL, California King, Full, King, King Pillow Protector, Queen, Queen Pillow Protector, Standard Pillow Protector, and Twin. It is only natural, after all, it costs less to produce a cover rather than a mattress. Thanks to that, the cover fits most mattresses. But you should that the fact if the cover fits or not doesn’t only depends on the size of the mattress. This cover is to be used with mattresses no higher than 12 inches. And there are higher mattresses. There 13 inches mattresses, there are 16 inches mattresses, and so on and so forth. You are the one whose responsibility is to make sure the cover you buy fits the mattress you already have. The cover has a “waterproof barrier”. But be advised, this so-called “waterproof” barrier does not mean that the cover itself is waterproof. “Waterproof barrier” is an abstract concept in this instance. All it means is that the cover is water repellant. It is protected from spills indeed, but haste action has to be made soon after you spill something, lest the fluid bleeds through the cover and into the mattress. It will take some time, though, so the cover might be considered somewhat waterproof, just not absolutely. But repelling water is not the primary function of this mattress cover. 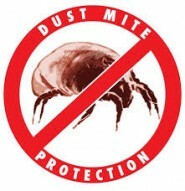 The protector is first of all used against dust mite, bed bugs, and allergen. It’s probably unnecessary for latex mattresses, but memory foam mattresses, for instance, are quite a different story. 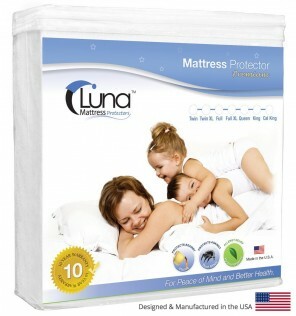 In case you want to get this protector for your mattress, feel free to buy it on Amazon.com. 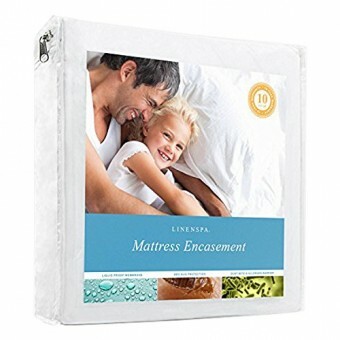 Since this cover is manufactured by the same company, it’s really no surprise it comes in those same ten varieties as the previous item, which would be: Full XL, Twin XL, California King, Full, King, King Pillow Protector, Queen, Queen Pillow Protector, Standard Pillow Protector, and Twin. The primary difference is that this mattress protector fits mattresses up to 18 inches in height. Now that is serious. You would be hard pressed to find a mattress higher than that. Of course, there are mattress toppers and all kinds of extra enhancements, but even if we take them into account, 18 inches would still be enough for most of them. 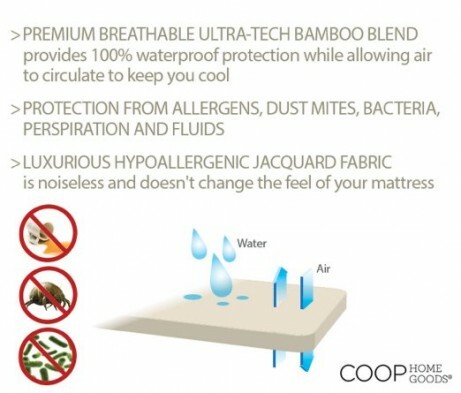 The mattress cover is also named “waterproof”, but it’s water repellant. Fluids do bleed through the protector, it’s just that they don’t do that in a matter of seconds, it takes them quite some time to leave a stain on the mattress itself. It’s a good protection against accidental stains, but not necessarily against those same stains if they happen at night. It’s more of a gamble unless someone is there to take care of the spill before it actually reaches the mattress. order it on Amazon.com right now! Much like the previous items, this protector comes in 10 varieties: King Pillow Protector Set (2), Queen Pillow Protector Set (2), Standard Pillow Protector Set (2), Full XL, Twin XL, California King, Full, King, Queen, and Twin. The protector supposedly handles as many fluids as it’s subjected to. Alas, that’s not quite so. While the mattress cover is indeed waterproof, it’s only good until too much has been spilled on top of it. Small amounts are no problem whatsoever, but introduce a peeing cat to it, and you might have a problem. Scratch that, you will have a big problem. However, if it’s not about a cat, if you want to buy a mattress cover for its anti-microbial and hypoallergenic qualities, this might be a mattress for you. It also very good at handling perspiration and most accidental spills. But the fact it’s not all that waterproof is not that bad. The mattress cover is breathable, too, and thus it makes your sleep very comfortable. There are many inexpensive rubber sheets or PVC covers, but you would feel like sleeping on a garbage bag. No the experience уou want, trust me. But even if natural, the cover is still elastic. It’s very good for you if you want it to fit your mattress, and you don’t have to worry about tying it or fastening it. All you have to do is to let it go once you put It on. Of course, it’s not fixed in a manner many other covers are, but it works. So don’t be alarmed. You can easily order it on Amazon.com right now and see it for yourself. 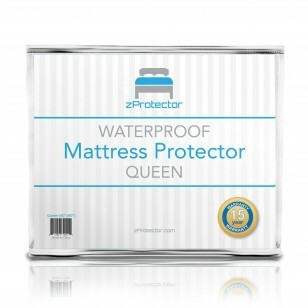 This cover from zProtectors comes in 7 varieties that fit seven mattress sizes: Twin, Full, Queen, King, California King, Full XL, and Twin XL. This mattress cover might seem not as good as the previous ones. How on earth does it rank higher than them, then? Well, the answer to that question is really simple. This mattress is “more 100% waterproof” than them. 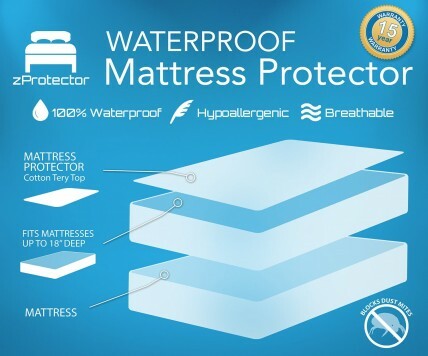 Indeed, whereas the other three protectors are water repellant, even though the description says they are waterproof, this mattress cover is indeed waterproof. It’s partially polyester, so that’s not really a surprise. The cover is very thin, so it should interact really well with memory foam, not interfering with the heat exchange. While that would not prevent some issues with hot sleeping, specific to memory foam, no problems with memory foam failure to react to your body heat would arise either. What’s really interesting is that this protector is the only product produced by zProtector. I mean it! I don’t really know how they manage to make enough money with just one item in production. They must be really good at it. Here are their care instructions for this protector. And you want to get a mattress cover like this, the single product manufactured by the company so far, you can do so online, just proceed to Amazon.com and make your purchase. Alas, due to the cover design, it does not tighten around the mattress when put on top of it. It’s made of stretch fabric, and thus fits mattress loosely. The fabric is also slippery. While that’s good for enhancing the cover’s anti-mite properties, that also makes it easier to slip on the mattress’s surface. Now this mattress protector is definitely waterproof, no ifs and buts. A good thing, too. After all, don’t all parents need a good mattress cover to protect the bed from any kind of baby accidents? Although if we’re talking about infants or even toddlers I strongly recommend that you don’t sleep with them on your bed. It might be dangerous for the child. SIDS is real, just (link|get a crib mattress) instead. Not that this cover would not do well with a crib mattress. After all, it does come in 7 sizes: Twin, Full, Queen, King, California King, Twin XL, and Crib. Yes, that’s right. So if you do think of getting yourself a non-waterproof PVC-free crib mattress, this mattress cover would make a good addition to it. But while the cover is waterproof, it stays damp for some time after you remove whatever fluid that has been spilled over the protector. However, the moisture doesn’t reach the bed itself, so the protector does its job fine. It is quite possible that this is how the waterproofness is achieved. It’s just not water repellant. 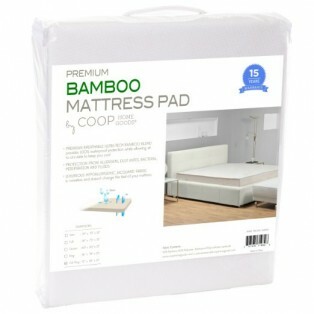 The mattress cover is vinyl, PVC and phthalates free. It is especially good to know if you buy the Crib Size. After all, many a crib mattress has a vinyl cover. If that’s not okay with you, just buy this mattress protector on Amazon.com and forget about the issue entirely! This particular mattress cover comes in nine sizes: Twin, Full, Queen, King, California King, Full XL, Twin XL, Crib, and Mini Crib. As you can see, two of those varieties are meant for cribs. Unfortunately, this protector is not 100% waterproof, just like many others in this list. But it is water repellant. As usual, as long as you’re quick to remove whatever spills on the mattress cover you happen to have, you should be fine. Or rather, your mattress should be. That said, the protector is a good choice if you don’t expect it to be subjected to huge amounts of liquids. Besides, protection from fluids is but a single quality a mattress is supposed to have. It’s hypoallergenic, mite-, bedbug- and mold-proof, and antimicrobial to boot. The mattress cover is also easy to clean, so even if something has been spilled on top of it, that should be no problem for you to get rid of. The surface of the protector is made of cotton, and it’s noiseless, so you won’t wake up suddenly in the dead of night because you made an awkward move. 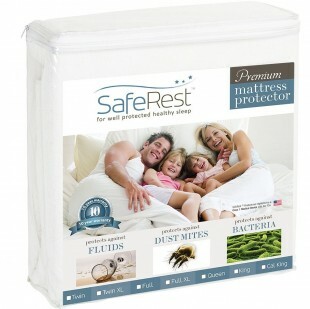 You can get this mattress protector on Amazon.com any moment you wish, just like any other item. But I suggest you make haste. After all, many people are willing to buy it. Just five sizes: California King, Full, King, Queen, and Twin. Not too many. Plus, no Crib Size, this mattress protector is meant for adults’ mattresses only. That’s rather unfortunate, after all, the cover is rather good otherwise. It’s a pad protector. What does that mean? Only that, aside from the protection itself, this cover offers you extra comfort. Which is pretty convenient if you ask me. The cover is free of phthalates, vinyl, and polyvinylchloride, and it’s OKEO-TEX certified. Contains waterproof membrane, which is still breathable. The cover also prevents you from overheating. It is compatible with Simmons, Sealy, Serta, and Tempurpedic mattresses. It doesn’t mean it cannot be used with any other mattresses, but those 4 brands are especially good in combination with it. And, of course, it’s mite-proof, hypoallergenic and antimicrobial. The cover, however, is a bit slippery by design, so be advised. The manufacturer recommends using sheets on top of the cover. I recommend using any sheets that have anti-slip qualities. 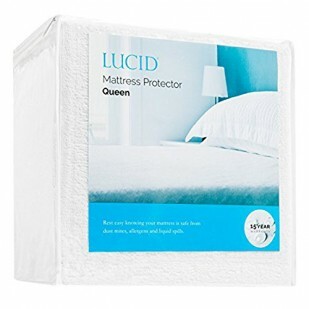 You can get this mattress protector on Amazon.com for a very modest prize. And let’s not forget it comes with a 15 years warranty. The mattress cover only comes in four sizes: Twin, Full, Queen, and King. Not many, is it? But it is waterproof, at the very least. Actually, it’s more than that. But this is still important. The only issue with the water protection is the, while the mattress cover does not let fluids soak through it, it does nothing to prevent them from running to the side of the mattress and soak into it there. It’s just too good at repelling water-based liquids. Although as long as we’re talking about amounts up to 1 liter, the mattress under the cover should be okay. After all, that’s how much liquid the protector can soak up. But be advised, it doesn’t do that instantly, so a large amount of liquid still might run over the cover before it soaks it. Of course, that is going to be no problem at all, as long as you make sure the protector covers the entirety of the mattress. If you see it doesn’t fit, well, you can always return it without waiting for any accidents to happen. But before you do that, check if you haven’t done any mistakes putting it on the mattress. After all, this mattress protector should fit all mattresses from 6 inches thick to 22 inches thick. 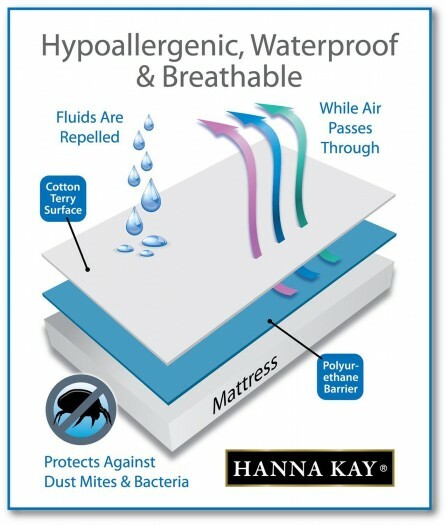 The primary function of a mattress protector is to keep free of mites, germs mold, and many other allergens. Well, it does it, too. If you want to get this mattress cover, follow this link and read more than 4,000 reviews. This cover comes in seven sizes: Full XL, Twin XL, California King, Full, King, Queen, and Twin. Not quite as many as some of the other mattress covers, but more than some others. 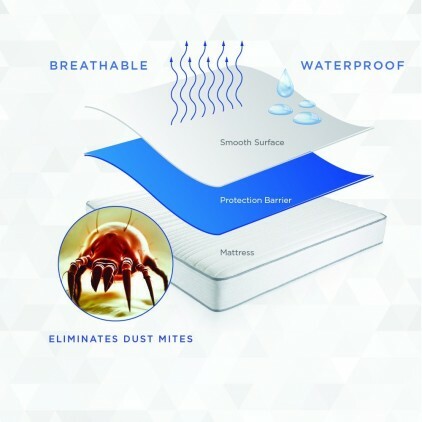 As expected from a mattress protector, this product is a good measure against dust mites, germs, and is hypoallergenic itself. The cover is made without PVC, phthalates and vinyl. 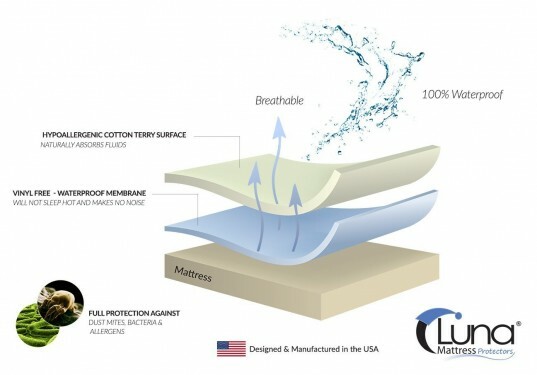 The mattress cover is based on Luna AirFlow Technology that adds breathability to the cover but is water-repellent. Unfortunately, as far as waterproof qualities go, this cover is not, in fact, 100% waterproof. Nor is it quite water-repellant, it’s more water-adsorbent than anything else. That’s what cotton is there for, I believe. Such qualities do have their uses, for small accidents. But I wouldn’t rely on this cover to handle any “big” accidents. All in all, this cover is good for adults, rather than kids, who might wet their bed. As long as you know bed-wetting is impossible, this cover is one of the best purchases. Speaking about purchases, you can get this cover online. Just follow this link and get your own mattress cover on Amazon.com. And here it is, folks, the number one item of today. I give you this premium mattress cover. Too bad it only comes in six sizes, which are Twin XL, California King, Full, King, Queen, and Twin. That’s not many. But for the quality? You know what, I think it deserves the first place anyway. 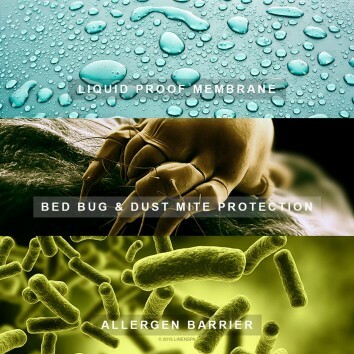 Of course, it protects you and your mattress from dust mites, bacteria, fluids and other unpleasant things. 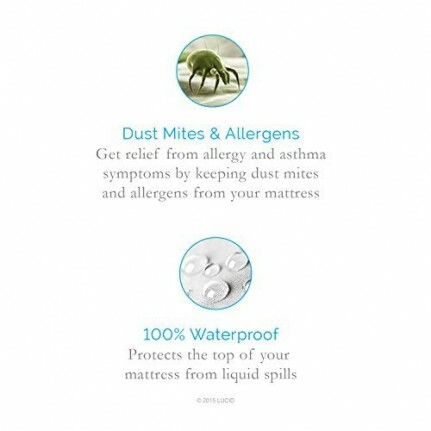 If you’re allergic, or suffer from asthma or eczema, or happen to have kids or pets, this is a good mattress protector for you. In fact, this cover is registered as a Class 1 Medical Device. If you have a mattress with a surface that has some special qualities, beneficial to your body, you don’t have to worry about giving them up. 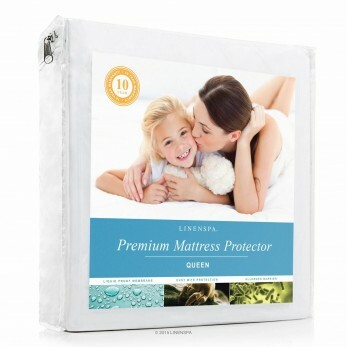 The protector does not change the feel of the mattress in the slightest. So whether you’re using a memory foam mattress or a latex mattress, that won’t change any orthopedic or therapeutic qualities the mattress might have. Of course, the mattress cover is waterproof, as is it breathable. With it, you don’t have to worry about bed-wetting, perspiration or simply any fluids-related accidents. If you still have any doubts about if you should buy this mattress cover, you can follow this link and read 12,000+ reviews other customers have left. Yes, you got it right. So you can add popularity to the benefits of this cover. Interestingly, every single mattress cover in this top 10 list is called water-proof, even though not everyone is completely waterproof. Some of them are water-repellant, but would not prevent water from soaking through them, some are in fact water-adsorbent and not waterproof at all. They protect the mattress by absorbing the fluids into themselves, but that is not quite reliable. 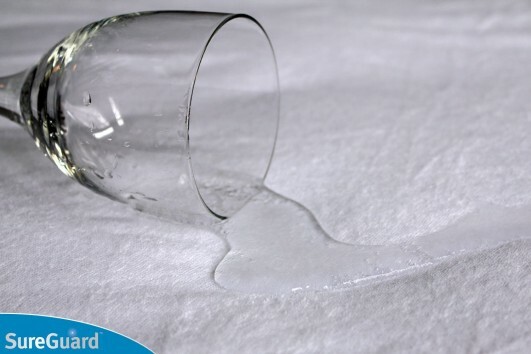 If a large amount of water is spilled over the mattress, it will soak into the cover and through it almost immediately. But even waterproof mattress cover should be treated carefully. While they do not absorb water at all and do let it bleed through, they do not stop it from running over the surface. So if the protector does not cover the mattress completely, the liquids would still soak into it, just at the sides. So why exactly did I included all these mattress cover into the top list? Why did I give them better places than to some completely waterproof covers? Because I’m not doing a review on waterproof covers specifically. Simple as that. The main feature of a mattress protector is the comfort and protection of the mattress from accidents. And they all do that perfectly. Next What’s The Best Mattress for Heavy People?